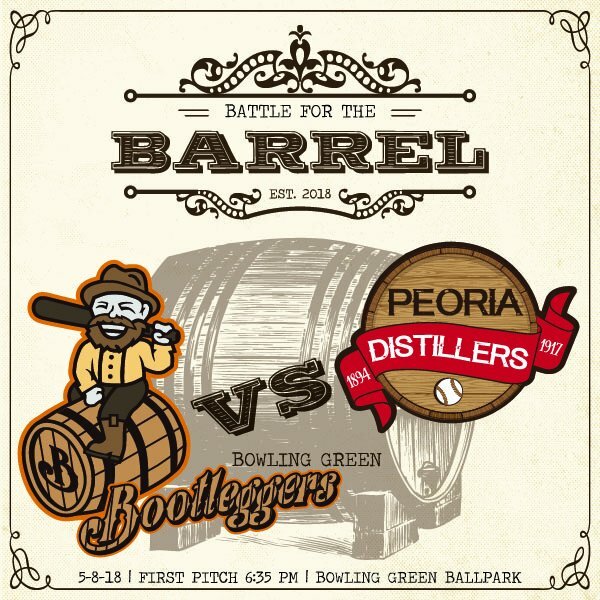 Promotional art for the inaugural “Battle for the Barrel” between the Bowling Green Bootleggers and the Peoria Distillers. The Hot Rods and the Chiefs will “Battle for the Barrel” during their three-game series in Kentucky this coming season, respectively playing as the Bowling Green Bootleggers and the Peoria Distillers. Bowling Green coaches and players first wore special Bootleggers caps and jerseys for a game in 2016 as a nod to the rich history of bourbon in Kentucky. “Bootlegger Night” was later named the best promotion in Minor League Baseball that year. The Hot Rods built upon that popular promotion for the 2017 season and are again this year. The Chiefs first donned their special Distillers caps and jerseys for a game last season, as part of a throwback promotion honoring the minor-league Peoria Distillers teams that operated from 1894 to 1917, and also as a nod to Peoria’s heritage as a top whiskey producer. The “Battle for the Barrel” technically takes place over three days, when Peoria plays a three-game series at Bowling Green from Monday, May 7, to Wednesday, May 9, but the teams will wear their special uniforms only for the Tuesday, May 8, game. The teams plan to make this an annual event, with a traveling trophy going home or staying with the winner of each three-game series. Additionally, the teams’ general managers — Peoria’s Jason Mott and Bowling Green’s Eric Leach — are good friends and have a bet riding on the outcome. The losing team’s GM has to send his winning counterpart a bottle of his favorite bourbon or spirit. The 2019 edition of the “Battle for the Barrel” will take place in Peoria. The Chiefs and the Hot Rods are in different divisions, so they play only one series against each other each year, alternating between the two cities. This entry was posted in Bowling Green Hot Rods, Midwest League, Peoria Chiefs. Bookmark the permalink.